Can you imagine what life would be like if you could accept failure, cellulite, wrinkles, imperfection, screw-ups, and vulnerability? I'll tell you what would happen: you would finally take that weight off your shoulders and build unshakeable, sustainable confidence. The truth is that confidence isn't about living up to anyone's expectations--it's about affirming, every day, that you're an effing boss. It's not the result of being skinny, making a six figure salary, finding your dream partner, or drinking a green juice every day. It requires patience, dedication, forgiveness, bravery, and an incredible amount of self-compassion. 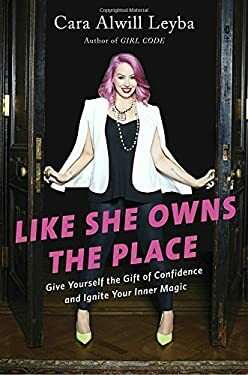 You've probably read that "confidence is a choice," and while that's true, it's more accurate to say that confidence is a series of repeated choices to accept yourself. To choose pride over insecurity. And to fearlessly show up in the world as the truest expression of yourself. It took me a long time to overcome all the BS. It took me a longer time to develop a rock-solid sense of inner-peace and become intimate with my intuition. To achieve real confidence that lasted longer than a sugar rush. My goal with this book is to share with you how I have arrived here, how I've helped my clients arrive here, and hopefully save you years of pain, shame, and uncertainty. Because, girl, I know how rocky this road can be. I'm going to show you how to block out all the noise around you, and how to free yourself from the opinions and judgment of others. I'm going to teach you how to trust your gut, reclaim your life, and rock what you've got. I'm going to show you how to own the place.